Regular Aleheads readers will note that a certain small outfit in Massachusetts has received an inordinate amount of pub on our humble site. I speak, of course, of Clown Shoes. Clown Shoes is the brainchild of Gregg Berman, an owner of Berman’s Wine & Spirits in Lexington, MA. Gregg contract brews his enticing offerings through the Mercury Brewing Company…best known for their Ipswich Ales line. Clown Shoes and Mercury paired up when…well, I’ll let you read about it here. Don’t worry, I’ll be waiting for you when you get back. While the Aleheads live all over this glorious country of ours, the founders of the site all hail from a small corner of the North Shore of Massachusetts. When a new brewery opens up in our old stomping grounds, we want the world to know. Clown Shoes has graciously reciprocated the publicity we throw their way. They made us a prominent “Friend” on their site and always link to the articles we write about them. Recently, they became the first brewery to ask us to post a press release on Aleheads. We happily obliged…particularly because the press release was pimping their new Eagle Claw Fist which Sudsy and Doc both assure me is a ridiculously good offering. Clown Shoes makes excellent beer. Ultimately, that’s what it comes down to. Make good beer and we’ll talk about you. Pretty simple. Wifey McHops and I split a bomber of the Brown Angel (courtesy of the good Doctor) on a perfect, 72-degree day in ‘Bama. After three months of 95-degree heat and 1,000% humidity, we enjoyed emerging from the McHops Monastery to remember what it feels like not to sweat the moment you step outdoors. Here’s where I should point out that I’m a huge fan of breweries that take smart risks and put interesting twists on classic styles. The staid, predictable brown ale is the most sessiony of beers, but it can be a little bland. I love that Clown Shoes boldly decided to amp up the hop profile in their version of the style. They call it a “Double Brown Ale”, but I’m not sure the Double/Imperial terminology is particularly apt since the hop profile and alcohol content aren’t that extreme (7% ABV on the Brown Angel…not sure about the IBUs, but I didn’t find it overly bitter). I would liken it more to the Terrapin Hop Karma which is a mash-up of a brown ale and a hop-forward American IPA (two styles that work remarkably well together). The nose is the high point of the brew. Lovely, delicate floral and citric hops float on top of an undercurrent of honey and molasses. It smells well-balanced, cleverly constructed, and as advertised. Nice work all around. The taste lets down the beer a little. The hops take center stage with a fresh, bitter, pine and lemon flavor which is wonderful. But the malt bill is very lacking. There’s a touch of espresso in the background which is interesting, but the malt profile tastes like thin malt extract and doesn’t have nearly enough heft, character, or body to balance the hops. It seems as if the brewers put so much thought and care into the hops that they forgot to build a strong brown ale base to play off of. The mouthfeel suffers from the the underwhelming malt bill and is a touch thin and watery. It’s certainly not egregiously thin, but not as robust as you would hope for a “Double Brown”. The finish is slightly astringent as there simply isn’t enough malt to cancel out the hop bitterness. Drinkability is quite high. It’s more refreshing than most brown ales and the less-than-full body and good carbonation keep it light on the tongue and in the stomach. Flaws aside, this is another intriguing beer from Clown Shoes and once again proves that they’re a brewery to watch in the coming years. 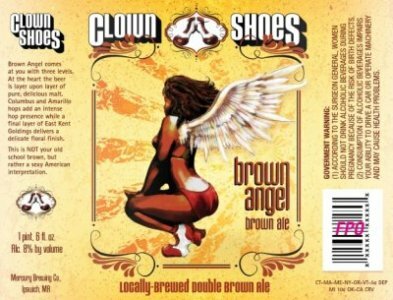 Posted in Tasting Notes.Tagged Brown Ale, Brown Angel, Clown Shoes, Double. Previous Post TOMMYKNOCKER HOP STRIKE!